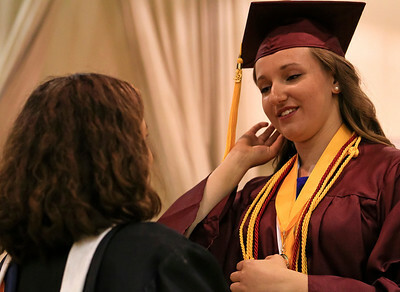 Brett Moist for the Northwest Herald Priarie Ridge Librarian, Amy Bland, give Valedictorian Katarzyna Robak a last minute pep talk before her address for the Senior Graduation Ceremony at Prairie Ridge High School on Saturday. 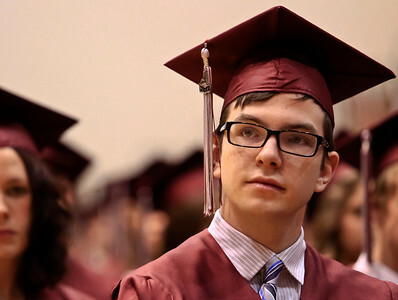 Brett Moist for the Northwest Herald Mike Ward nervously awaits his time to graduate high school before the Senior Graduation Ceremony at Prairie Ridge High School on Saturday. 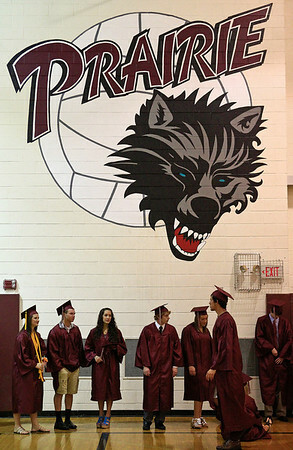 Brett Moist for the Northwest Herald Prairie Ridge Graduates await the start of the 2012 Senior Graduation Ceremony at Prairie Ridge High School on Saturday. 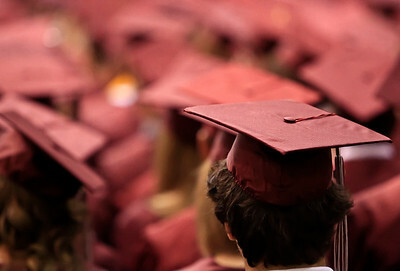 Brett Moist for the Northwest Herald William Dyer III looks up at the crowd during the 2012 Senior Graduation Ceremony at Prairie Ridge High School on Saturday. 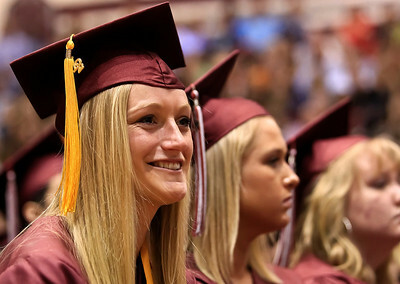 Brett Moist for the Northwest Herald Kathryn Jablonsky gets emotional during the 2012 Senior Graduation Ceremony at Prairie Ridge High School on Saturday. 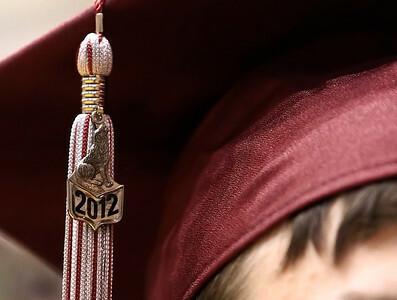 Brett Moist for the Northwest Herald Each Graduating Senior was given a special Tassle for the 2012 Senior Graduation Ceremony at Prairie Ridge High School on Saturday. 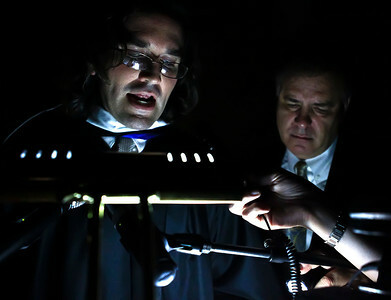 Brett Moist for the Northwest Herald District 155 President Ted Wagner helps out speaker Daren Dusenske by shining a flashlight down on the graduates list during the 2012 Senior Graduation Ceremony at Prairie Ridge High School on Saturday. Power went out in the middle of the diploma distrubution part of the ceremony. 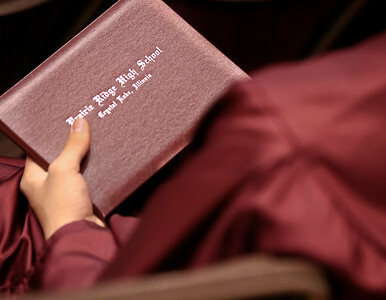 Brett Moist for the Northwest Herald Each student recieved a special diploma jacket during the 2012 Senior Graduation Ceremony at Prairie Ridge High School on Saturday. 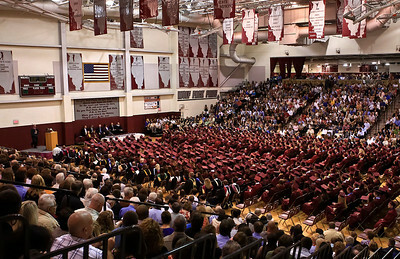 Brett Moist for the Northwest Herald Graduating seniors await to be called in for the 2012 Senior Graduation Ceremony at Prairie Ridge High School on Saturday. Priarie Ridge Librarian, Amy Bland, give Valedictorian Katarzyna Robak a last minute pep talk before her address for the Senior Graduation Ceremony at Prairie Ridge High School on Saturday.